Do you want to know which dinosaurs became swimming dinosaurs? Or learn that most of the huge swimming monsters we know of were sea reptiles and not dinosaurs. These huge creatures lived in the sea the same time dinosaurs roamed the Earth. Find out how big they were, what they ate - facts, pictures and information for kids. Of all the dinosaurs, it was Spinosaurus that took to the water. This was the biggest meat eating dinosaur that we know of. Scientists think it could live on both land and water like crocodiles. But it could definitely swim (it had webbed feet) and hunt in the water. It probably ate sharks and large fish. 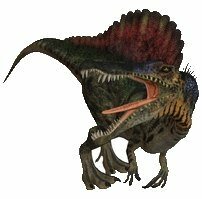 Spinosaurus is the only dinosaur we know that spent time living in the water. Another dinosaur, Ceratosaurus, could probably swim and catch aquatic prey, such as fish and crocodiles. Spinosaurus was not the only large creature living in water! The sea was teeming with large and ferocious reptiles of all shapes and sizes. Here are a few of them. The first large ocean reptiles were nothosaurs, which means 'false reptile'. They lived in the Triassic period probably like seals of today live. There are about a dozen different species but the most well known of them is the Nothosaurus. It was about 4 metres (13 ft), with long, webbed toes and it may have had a fin on its tail. 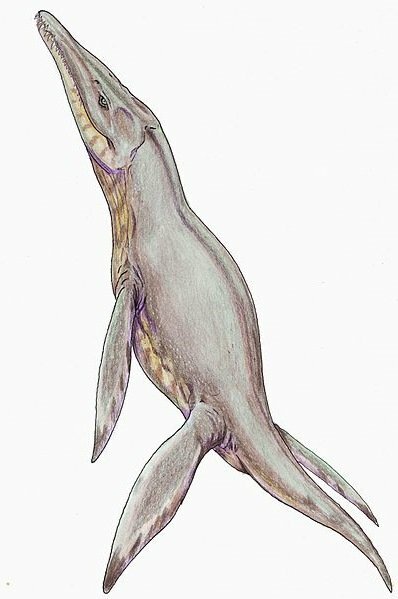 Plesiosaurs came next, living from early Jurassic until the end of the Cretacious period. 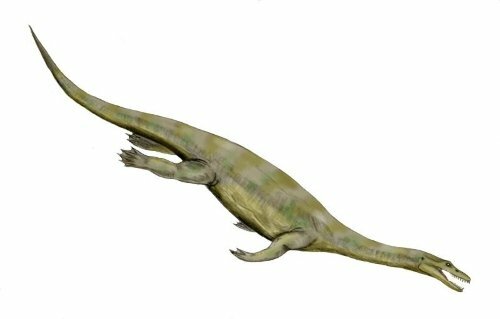 Most of them had long necks and small heads - but ranged from about 2.5metres (8 feet) to 14 metres (46 feet) long. The biggest of these was the Pliosaurus. It had teeth over 30 centimetres (12 in) long and a bite four times more powerful than a Tyrannosaurus Rex. It is estimated to be 15 metres (49 feet) long. 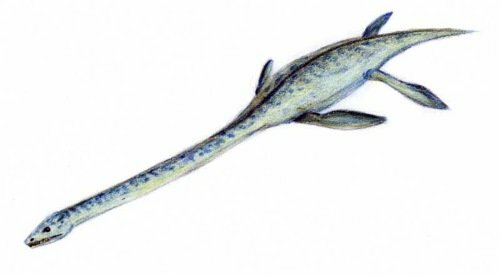 Another plesiosaur is the long-necked Elasmosaurus. It had four paddle shaped flippers and was about 14 metres (46 ft) long. They were very slow swimmers and would probably have followed schools of fish to eat. Their necks were so long they wouldn't have been able to lift them above the water unless they were in very shallow water with their body lying on the bottom. Why are they not swimming dinosaurs too? The word 'dinosaur' has a very specific meaning. Scientist use it to describe a particular type of creature (like Spinosaurus) but this does not include sea reptiles, or the so called 'flying dinosaurs'. One of the reasons is where their limbs are. Dinosaurs have their limbs under their body. But sea reptiles (like lizards and crocodiles), have limbs that stick out from the side.